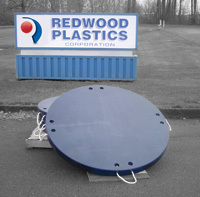 Redco™ Outrigger Pads, made of the engineering-grade plastics UHMW or cast nylon, will not rot, rust or support mold growth. They are UV-stabilized and will provide many years of use. Unlike wood, plastic pads get stronger in cold weather. Money is saved over the long-term as wooden pads do not need to be purchased or made. That time and money does add up! However, your crew also has piece of mind that the critical load of the crane rests not on crack-prone plywood or 2×4’s, but engineering-grade plastic instead.